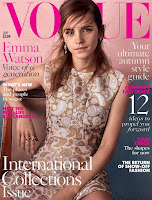 EMMA WATSON is the cover star for Vogue's September issue. The actress and campaigner appears for the second time on the cover - following her debut in December 2010, for which she was shot by Mario Testino - this time photographed by Josh Olins. 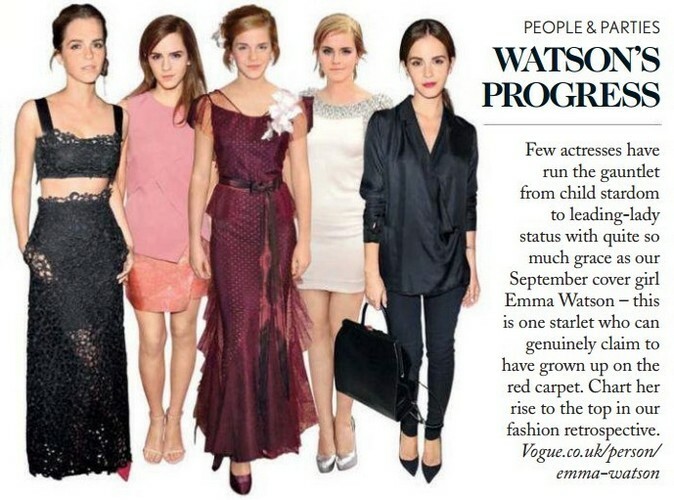 Wearing a white and gold jacquard dress by Stella McCartney and with her hair loosely pulled back, Watson is pictured wearing minimal make-up under the cover line "Voice of a generation". The September issue will be available on newsstands on August 6. 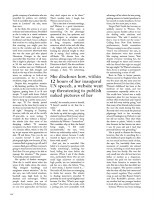 She also talked about gender equality with fashion figures [HERE]. PLEASE credit the blog if you use it (parts or whole). It took me forever, with cramps in the fingers, and burning eyes, to do it as the pictures were a bit small to read (I made tiny mistakes in the text anyway so I'l be able to tell. Mouhahaha). Thank you tons to the angel who sent me those pictures, Lottie Payne. Interview takes place in Fleet Street's Mayday Rooms where Emma comes regularly to read or research. She was the one who chose the location. She was then reading a Fifties treatise on early feminism. There was an interview, the photoshoot, and then another interview. It took place a week before the filming of 'Beauty and the Beast'. "I've literally written out how I should deal with people when they first recognize me, because unless you are really quick about engaging them then they start to slip in to this weird place where they look at you as this external being. I think that's why, at times, I need to be on my own, to recharge. Because I get... not overwhelmed, but now and then I need to be in a space where I don't have to negotiate that kind of conflict. I could walk down Oxford street now if I really wanted to, but I'd have to keep up a pretty mean pace. If I've already passed someone, by the time they're ready to do their second take then I tend to be all right. I wouldn't shop at Topshop without a friend. If someone recognises you, there tends to be a bit of a domino effect, which is why I'll try to get anyone who approaches on side. I'll ask them 'Can you do me a massive favour? I can't do a photograph right now because, if I do, a camera flash is going to go off, and if a camera flash goes off thenn everyone's going to stand around and look at me. And then I'm not going to be able to manage the situation.' Generally people understand." "Big designer handbags and sunglasses attract attention. Often people don't notice you out of context. For instance, if I fly Easyjet, no one ever approaches me because they don't expect me to be there. "I felt really uncomfortable, even before my relationship ended, I went on a silent retreat, because I really wanted to figure out how to be at home with myself." "I probably do send myself slightly mad because I'm like, "What's your angle on this?" "She said I needed to find a way to block negativity out. "It was a very important place for me, because my mother often worked late and I stayed on and did every activity going. It was really nice [visiting her old teacher at her secondary school] because he has known me since I was 12 years old and I feel the personal history very grounding." "My parents couldn't take the time off, they had careers and they weren't together. They couldn't swap in and out like Rupert Grint's or Daniel Radcliffe's parents. And my mother had my younger brother to look after, she couldn't leave him. "Part of me relaxed after I took on that position, it gave me a sense of belonging and purpose. Everything clicked in to place, in a way that it hadn't before. I understood what I'm here to do and where to channel all this energy that has been coming at me. I now feel this sense of peace. People say that I'm different since I did it. Initially I was supposed to launch the campaign by writing something that a newspaper might publish. I wrote a draft and sent it to my mum, dad, the UN and my publicist, and everyone had a different critique. By the end, I didn't even know what I was saying any more. I felt like people were trying to silence my voice. [The night before the speech] I was hysterically sobbing in my hotel room, thinking, I can't do this. I was just terrified. And then I Skypped a friend who said, "Go through it again and ask yourself, if you were hit by a bus tomorrow, would you be comfortable with every single line?" She didn't remove a word. "I'm not paid to say this, but I think Raf Simons is a genius"
"I wouldn't say I am a control freak, I just really want to have things to be clear in some way. But to be more OK with the messiness of life is something I've been trying to learn through meditation." "The boyfriends or partners I've had have generally made me feel really cherished. They've built me up. I certainly haven't found that with doing all that I do or being all that I am, that I've struggled in my love life. I just think it's very patronizing towards men. It undermines them." She's begun working on a September concert, at the Barclay's Center in Brooklyn (The UN informed Snitchseeker since that the concert was postponed to 2016). "So I'm writing letters to acts to figure out who will perform." And there is something else too, which she talk about, but it's another He For She development that makes her rock on her chair, because "someone just wrote me a big cheque." "I was interested that despite everyone watching her, she still managed to dance and interact with her friends that night (one of Patti's concert) as any girl her age might." "She's one of the greats. She has this intensity, she's willing to give more and more. She was really tough." "She is extraordinarily focused in her pursuits and sober in her thinking What has always struck me about her is her absolute confidence in herself and her intuition. And her resulting independence." "Emma loves fashion. She embraces it because she isn't afraid of it." 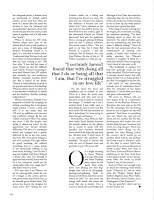 Emma does ashtanga yoga (she says that she could teach it), meditates, writes poetry and, when unhappy, a diary ("It's interesting actually, I haven't needed to do that for a while."). After filming Beauty and the Beast, before the concert, she'll maybe go to another silent retreat, and perhaps she'll take a trip to Istanbul. She'll also make time for a swim in the Hampstead Heath Ladies' Pond and visits the Tracey Emin and Francis Bacon exhibitions at the Tate. And then is that jigsaw puzzle on her dinig-room table she needs to finish "before I lose all the pieces". Directors she'd love to work with: Joe Wright, Danny Boyle, Kathryn Bigelow, Jean-Marc Vallée, Ron Howard, David Fincher, Luca Guadagnino, Clint Eastwood.